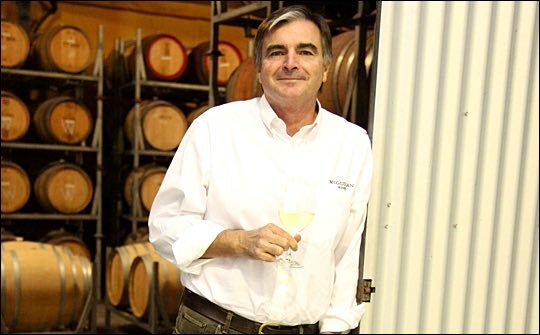 Winemaker Neil McGuigan is CEO of Australian Vintage, one of Australia’s largest wine producers and the second largest vineyard operator in Australia with over 2,700 hectares across key winemaking regions. It is the maker of Australia’s number one selling bottled red wine, McGuigan, which has just reached number four global wine brand by volume in the UK. This news was announced at the London Wine Fair along with the launch of a new sparking wine McGuigan Frizzante. Figures released last month by Nielsen demonstrate a +22% YTD volume growth for McGuigan in the UK (week ending 28.3.2015), making it one of the fastest growing brands in the past 12 months and the second most popular Australian brand in the UK. McGuigan Wines’ strong performance comes on the back of an improved half year profit of AUD$4.4million for parent company Australian Vintage Limited (AVL) and an increase of sales for the McGuigan brand in the UK and Europe of 28% in the last six months of 2014. “Our philosophy is to bring quality wines at affordable prices to the market, explains Neil. “We want to embrace them into wine and take them on the wine journey - not scare them off - otherwise they will go and drink beer, cider or spirits. To celebrate the launch of McGuigan Frizzante, McGuigan Wines held a lunch BBQ at London Wine Fair, which was hosted by Neil with TV chef John Torode working his magic on the ‘barbie’. Torode believes you should be able to drink any wine with any food and it’s up to him to make the food to go with the wine. “He was at my place one day,” says Neil, “and he said that what we were going to do that day was to take chicken into the red wine spectrum and I said ‘well OK how are you going to do that?’ So he used tarragon, sour cream, tied it up, chucked it in the oven and, when it came out, he asked what is it going to go with? I looked at him and I went: ‘Merlot?’ and he said ‘yep, I reckon so too’ and so we put it together and ‘bingo’ there it was! He had taken the chicken into the red wine spectrum. Therefore, proving there aren’t any rules about wine and food. “So what we have got to do is engage with people, embrace them, bring them into wine and food and then take them along the journey; and eventually they may drink first grade Bordeaux. They don’t have to know anything about wine – they have just got to enjoy it. Wine is very simply about having purity of fruit. Purity of fruit at every price point, flavour, lightness and refreshing – every glass of wine must be refreshing, so that when you finish the glass you want to go and have another. “A lot of people will talk about terroir, regional character and blah, blah, blah…well, that’s fine but that’s down here…get the wine pure to start with. Perfect colour whether white or red, and a beautiful fresh lifted fruit character. Yes, you can have oak and you can have yeast autolysis; you can have all those characters, but you must have purity of fruit on the palate with no phenolics and then that’s when your pure regional characters will come through...not funky regional characters. So, you want purity of fruit to start with – and that’s what we do very well in Australia – then the wines will age and all these other secondary and tertiary characters will come about just through ageing. But if you don’t have the purity of fruit to start with, you are not going to end up with the developed wine, with the characters that you want to show people. Referring specifically to his new McGuigan Fizzante wine Neil adds: “The other thing you have got to do is to continue to innovate. We have been making sparkling wine in Australia emulating the French methods with yeast autolysis and all that sort of stuff, but we forgot to ask the consumer what they wanted, which our friends from Italy did and they have done a fantastic job with Prosecco – It’s clean, it’s fresh, it’s juicy and, yes, it’s short, but it’s an easy drink and you don’t have to think about it too much. Neil explains that he is still looking for more vineyards in a cooler climate to push the wines he can produce up another level. “I want cool climate – not cold climate – that’s not what we are about. Australian wine still must have generosity of flavour, which you are not going to get from cold climes. You will get beautiful refinement and elegance and possibly length of pallet, but I want wines to be a little more generous than that. So we are after cool not cold. We want the right clones and the right sites for the right varieties – so there’s still lots of work to be done.